Designed for Infinity There are 24 products. 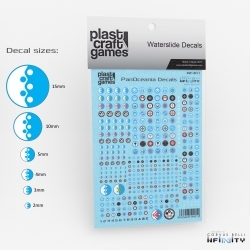 Infinity the game waterslide decals for Yu Jing, 105 x 148mm sheet. This sheet includes logos for the faction and sectorial Armies and different alphanumerical symbols to further customize your army with an extra level of details. Infinity the game waterslide decals for PanOceania, 105 x 148mm sheet. This sheet includes logos for the faction and sectorial Armies and different alphanumerical symbols to further customize your army with an extra level of details. Mercenaries Waterslide Decals 105 x 148mm sheet. This sheet includes logos for the faction and Sectorial Armies and different alphanumerical symbols to further customize your army with an extra level of details. Tohaa Waterslide Decals 105 x 148mm sheet. This sheet includes logos for the faction and Sectorial Armies and different alphanumerical symbols to further customize your army with an extra level of details. Aleph Waterslide Decals 105 x 148mm sheet. This sheet includes logos for the faction and Sectorial Armies and different alphanumerical symbols to further customize your army with an extra level of details. Combined Army Waterslide Decals 105 x 148mm sheet. This sheet includes logos for the faction and Sectorial Armies and different alphanumerical symbols to further customize your army with an extra level of details. Nomads Waterslide Decals 105 x 148mm sheet. This sheet includes logos for the faction and Sectorial Armies and different alphanumerical symbols to further customize your army with an extra level of details. Haqqislam Waterslide Decals 105 x 148mm sheet. This sheet includes logos for the faction and Sectorial Armies and different alphanumerical symbols to further customize your army with an extra level of details. Ariadna Waterslide Decals 105 x 148mm sheet. This sheet includes logos for the faction and Sectorial Armies and different alphanumerical symbols to further customize your army with an extra level of details. Yu Jing Waterslide Decals 105 x 148mm sheet. This sheet includes logos for the faction and Sectorial Armies and different alphanumerical symbols to further customize your army with an extra level of details.